John G. Peters (ed.). A Historical Guide to Joseph Conrad (Oxford: Oxford University Press, 2010), pp. 252. Hardback, £65; paperback, £18.99. John G. Peters opens this excellent contextualization of Conrad’s career with a perceptive overview of the key literary techniques that the writer pioneered, positioning him as an early Modernist who, for example, experimented with the fragmented and disjointed narratives that anticipated the stream of consciousness techniques present in the works of the celebrated modernists, James Joyce and Virginia Woolf. This introduction moves deftly across the range of Conrad’s works in a way that highlights the key elements that make his fiction so distinctive and so modern. As is expected of an introduction to an edited book, Peters goes on to summarize the subsequent chapters with insight and clarity: it is a fast-paced and lucid introduction to what is a very welcome volume. Larabee’s own formulations of how Conrad used his seafaring experiences will also be a “lodestar” for future explorations of the sea fiction. 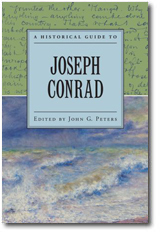 In “Conrad and the Literary Marketplace,” Joyce Piell Wexler astutely recognizes the contradictions in Conrad’s responses to the sales and reception of his works. Furthermore, she is conscious of how he presented himself as a literary artist, stating that “Conrad portrayed himself both as the romantic creator, powerless before his imagination, and as a careful workman honing his skills” (78). This essay is an accomplished survey of Conrad’s publishing history from his early association with, and dependence upon Edward Garnett, through his work for Blackwood’s Edinburgh Magazine, to his success with Chance. Wexler’s account of Conrad’s publishing experiences is steeped in a deep knowledge of the Victorian and Edwardian literary marketplace, and her navigation of Conrad’s literary career offers some keen insights into how the writer responded to the vagaries of literary publication. Using copious extracts from his letters, Wexler provides a convincing account of how Conrad grew from a tentative, fledgling author in the 1890s to a confident and pioneering novelist. Along the way she also provides a compelling account of his relationship with his reading public, concluding that “Conrad inveighed against the public, but he could not renounce it” (95). The next essay, Allan H. Simmons’s “Conrad and Politics,” is a master-class in Conradian history. The essay begins by placing Conrad’s work and literary relations within the context of European history, in particular his relationship with both Poland and Russia. As Simmons says of the latter, “Conrad is at his most fiercely denunciatory – and at his most prescient – about things Russian in his nonfiction” (110). Simmons also provides a very informative and useful digest of the British political scene in the 1880s and 90s, observing that “Conrad thus entered into British society at a moment when its political landscape was being radically redrawn,” and that he “engages with British public life at a moment when the country is adapting itself to the idea of mass participation in national politics” (114). The essay’s second half turns to Conrad’s fiction and how that fiction responded to the various political considerations of the time, including imperialism. Speaking of his Malay fictions, Simmons astutely observes that instead of perpetuating a “them-and-us distinction,” they “recognize an essential similarity between races, viewing them instead as puppets of historical and political processes” (120). The essay ranges over Conrad’s writing career with confidence and considerable insight. His “major phase” is discussed in relation to the political issues behind each text with the skill and precision of an expert Conradian. As a survey of Conrad’s response, both personally and in his literature, to the political conditions of his time, this is a very satisfying essay indeed. What is of interest here is the way in which GoGwilt skillfully directs attention to the political and economic contingencies in Conrad’s colonial fiction, from Almayer’s Folly through “Heart of Darkness” to Under Western Eyes. At the essay’s centre is a fascinating and illuminating discussion of racism with regard to “Heart of Darkness,” and a robust effort to tackle Achebe’s accusations of racism in that text. Gogwilt’s contribution closes with a consideration of “Conrad’s English,” in part a response to Hugh Clifford’s claim that Conrad chose to write in English over writing in French. This essay provides new perspectives on Conrad’s imperial fiction, suggesting that, despite the significant attention already paid to this aspect of his oeuvre, there is much to be gained by further investigation both of Conrad’s intentions, and of the cultural and linguistic implications of his texts. White ranges over Conrad’s oeuvre to demonstrate that the techniques he was developing helped to constitute some of the cornerstones of what were to be recognized as the distinctive features of literary Modernism; and she uses Virginia Woolf to very good effect to make her point about Conrad’s contribution to the movement. While foregrounding Conrad’s insistence that the reader should actively participate in the construction of meaning in literature, White also acknowledges the challenge posed to many readers and critics, with the result that Conrad was often, and still is, regarded as a difficult writer. She highlights the key debates and figures of the early twentieth century around which and whom Modernism was to coalesce; and at the heart of the argument is Conrad. Such a survey of the movement’s early genesis is wholly appropriate, and it will be particularly interesting for scholars new to Conrad who seek a clear understanding and explanation of how he contributed to emerging literary Modernism. This volume closes with two very helpful pieces: an “Illustrated Chronology” of Conrad’s life and works, and Peters’s excellent “Bibliographic Essay” that gives an overview of Conrad criticism from the earliest responses to the present. What is particularly impressive about this volume is its consistency: each essay follows a structural pattern that complements and mirrors the others. This approach has ensured a uniformity of quality in the essays, which are not only rich in historical and political detail, but also rich in insights from some of the most respected scholars in the field. For any student or researcher new to Conrad this should be required reading, but the seasoned Conradian will find here much to consider in terms of where Conrad studies may go in the future: Peters is to be congratulated on producing a truly stimulating and impressive volume.